Adventure, fun — and food! In my next life, I want to be Dian Fossey. Well, not quite. I’d rather not be mysteriously murdered as she was in the jungles of Rwanda where she studied and lived with mountain gorillas. After observing, photographing and admiring these magnificent beasts in the dense bamboo forests high in the mountains of Rwanda, I was smitten. It is easy to understand Fossey’s fascination with the human-like gorillas which share 98 percent of our DNA. Children romp and play, chasing one another through the thick brush. Toddlers cling to mothers, often piggy-back. Mothers nurse babies. And Big Daddy, the awesome silverback, keeps a vigilant eye over all. They were in our midst, the 22 member Kwitonaa gorilla family. One youngster raced by and grabbed the hand of a member of our trekking group. Another trekker was punched – lightly — by a teenager whose path he accidentally blocked. I was captivated by a nursing mother, no more than a foot in front of me. I could have easily touched her, but I dare not. We had been warned not to get closer than 10 feet to the beasts. Impossible. They were all around us, up close, and obviously accustomed to this parade of curious creatures who snapped away with all manner of cameras. Mountain gorillas are “about as dangerous as pet lambs,” Fossey once told Alfred Hitchcock, apparently to his disappointment. Mama occasionally cast me a stern glance as if to say, “Oh no, you guys again.” Not far behind her, higher up on an incline, sat the silverback, a picture of majestic power, like a king with his subjects at his feet. He seemed disinterested, but weighing in at close to 400 pounds; I did not want to upset him. 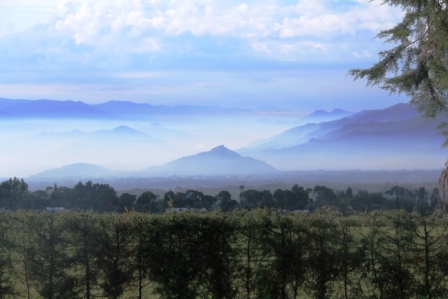 The Virunga Massif, volcanic peaks usually shrouded in mist along the borders of Rwanda, Uganda and the Democratic Republic of Congo, are home to 10 gorilla families visited regularly by tourists. 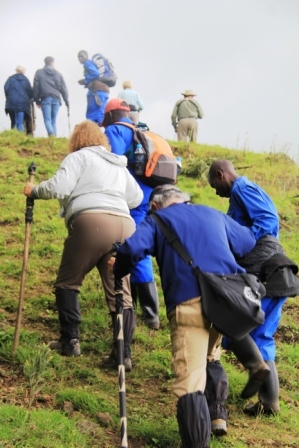 Treks to observe the gorillas are strictly controlled and organized by officials in Rwanda’s Volcanoes National Park. Eager tourists arrive at park headquarters at 7 a.m. where they are divided into groups of eight, supposedly according to the difficulty of the hike ahead. Each group (a maximum of 10 groups or 80 tourists per day) is accompanied by a guide, trackers carrying machetes to blaze a trail, a gun-toting guard (in case of attack by Cape buffalo) and porters. 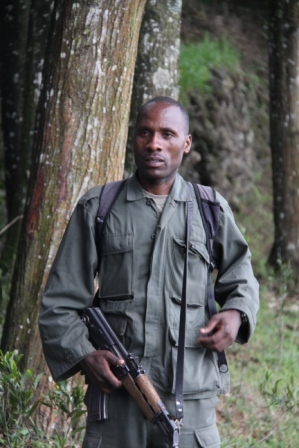 Guides are in radio contact with other trackers stationed in the mountains who monitor the gorillas and advise them of the various gorilla family locations. No longer young and fit, we asked to be in an “easy” trekking group since we had heard the hikes to locate the gorillas can take up to four hours, one way, over difficult terrain. I had been very nervous, not certain we were up to the challenge. My fears were assuaged when I met the others in our party: Fran (66) and John (76), seasoned hikers from Scotland; Selma (72) and Barry (a bit older) from D.C., and a mother- son couple from Germany. Annette, who appeared to be in her 70s, was on her fifth gorilla trek. “I’m addicted,” she said. Selma announced to the guide that she had had two knee replacements and could only hike if the terrain was flat. 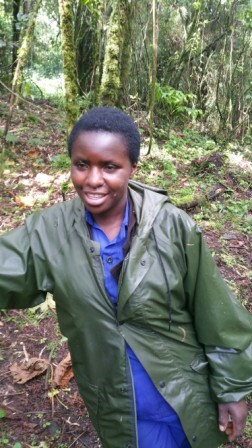 She explained that a woman in her hotel had seen the gorillas the previous day after an easy, 37-minute hike. She expected the same. Poor Selma…close to three hours later, soaked to the bone, we finally found our gorillas. The hike started out as a pleasant walk in sunshine through farm fields. The sun soon disappeared and we started to climb, over rugged, rocky, slippery terrain. Up and up. Steeper and steeper. We were at an elevation of 8,500 feet. I was frequently out of breath, but there were rest stops. Porters help with the ascent. Fortunately I had hired a porter, Peragie, a tiny woman half my size but my savior. I had little to carry, just a small backpack with a water bottle and my camera. But, for only $10 (the standard charge for a porter), I figured it might be useful. She could hold my camera if I wanted to take photos with the phone and vice versa. This mini power house did far more. On the steep sections, she took my hand and literally pulled me up. When the rains came, soon into the trek, she wiped my face and glasses. She tucked my pants into my boots – to keep the red ants away. She spoke no English, but I learned that she was 30 years old, a widow and mother of two young children. Her calm, gentle, caring demeanor was an inspiration and kept me going. “My knees are wobbly. I can’ go any farther. I won’t make it,” announced Selma, not far into the hike. Our guide assured her she could – would – make it. When we came to a high rock wall separating the fields from the forest, several porters lifted her over the obstacle. We charged on, but the going in the tangle of jungle vines, roots and branches was a challenge. Rain did not help. “How much farther?” Selma asked time and time again. However, we all were beginning to wonder if we would ever find the gorillas. Over and over, guide Ignacie assured us they were not far ahead. “They’ve been here,” he explained as he surveyed the terrain. Of course, they were not waiting for us, but continually on the move, higher and higher, searching for more tasty bamboo. At last – a big patch of black lumbering through the jungle green ahead. We stopped. We could hear bamboo branches breaking. Suddenly more masses of matted black fur, on the right, left, ahead –all in motion. We were awestruck. After the grueling trek, it seemed miraculous. Ignacie told us the youngest member of the family was a seven-day old baby. We came up behind the mother, cradling the infant in her arms. Unfortunately the 22-year-old silverback was ahead and she moved on to dutifully follow him before I could get a photo. The kids – all ages – were frolicking all around. Two teenagers got into a spat. “They are drunk,” Ignacie said. Apparently overdosing on bamboo has the same effect as too much booze. The rain stopped. We moved about, each of us zeroing in on different family members for close up photos. It was thrilling, amazing, and beyond our expectations to be so close to these intriguing creatures. 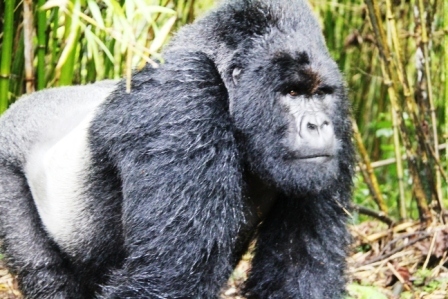 Trekkers are supposed to spend no more than one hour observing the gorillas. Perhaps because our journey had been so long and arduous, Ignacie was generous. We were with them a bit longer, but not long enough. You cannot get bored watching gorillas. The trek down was worse than the ascent. It started to pour. This was the rainy season, and these rains were like no others I have known. The trackers decided to find a shorter route back through even denser jungle growth. 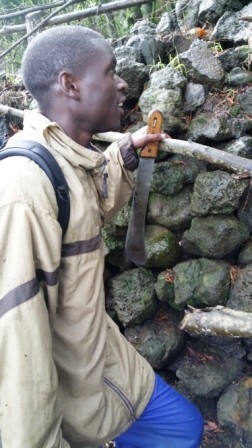 The lead man thrashed a path with his machete. If it hadn’t been for my guardian angel, I surely would have slipped or tripped. Selma survived. “I am glad it’s over,” she said as we reached the end. Had Ignacie not insisted, she obviously would have quit. We later learned that rather than sending a participant back, the guides call for a stretcher. 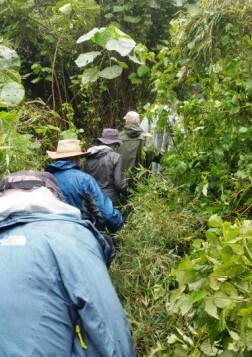 Trekkers are carried to the gorillas at an extra cost of $200. And, it is not uncommon for handicapped tourists to hire porters with a stretcher to take them to marvel at this wonder of nature. Group photo while we waited for Selma and Barry who were far behind. 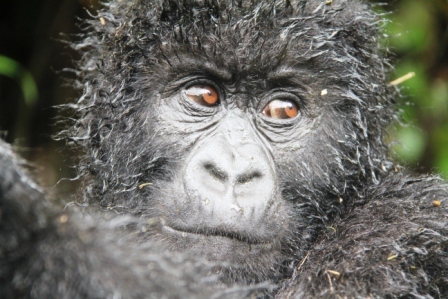 The gorilla experience is costly, $750 per person for the required permit. This includes the guide, trackers, guard, but not the porters. There is no shortage of visitors, however. Since 2004, the number of gorilla customers has almost tripled: 20,000 in 2014. Much of the revenue helps fight poachers, as well as contributes to the country’s efforts to develop a high end tourist industry and continue its recovery from the horrific genocide of 1994. Back in the early ‘80s when Fossey came to Rwanda, there were only about 240 mountain gorillas in the wild. They cannot survive in captivity. Today the number is estimated at about 900, with some 300 in the Volcanoes National Park. 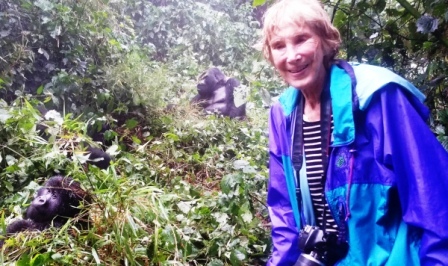 Annette, our intrepid trekker from Germany, was planning to set off again the next day for another gorilla trek – her 6th. She said she had never been so close to the gorillas as she had on our trek, nor had she ever been on such a difficult trek. Finding the Kwitonaa family did take far longer than anticipated, but only Selma complained. It is very rare that guides do not find the gorillas. If that happens, trekkers are offered the chance to try again the next day. Prosper Uwengeli, the park’s chief warden, told a New York Times reporter that in more than 30 years, guides have never had to shoot a gorilla and no visitor has ever been harmed by one. In a research report, Fossey wrote that mountain gorillas are “dignified, highly social, gentle giants with individual personalities and strong family relationships.” Like Fossey and countless others who have watched them in the wild, I am enamored of these gentle giants and, if it weren’t so costly, would gladly endure another trek for another visit. If not already a Tales and Travel follower, sign up (upper right) so you will not miss these exciting future posts. Your address is kept private and never shared. Like my blog? Tell your friends. Please leave a Reply below. Feedback is welcome. I love to know what my readers think about my posts. It’s time for a hearty soup. East German Soljanka, a recipe from my friend and food writer Sharon Hudgins, is perfect to warm both body and soul. See Today’s Taste, column at right. 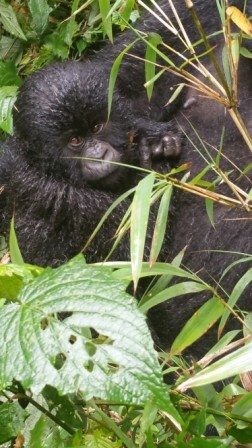 Leah, after reading of your experiences here, seeing the gorillas for ourselves has moved to the top of my wish list. Thank you for an excellent article as well as the information on the tour company you selected. I too would require an “easy” hike but I’m confident that the draw of seeing these magnificent creatures up close would propel me forward. Thank you. I had asked a young, adventurous world traveler what his top travel experience was. “Gorillas in Rwanda” was his answer. That did it. We had to see them. I agree with him. Hate to use the cliche, but it is an experience of a lifetime that you will treasure. Because our hike was more than we had bargained for, perhaps we appreciated the gorillas even more. Go for it! If the cost seems prohibitive, suggest you go as soon as possible. Our cost to Uganda $285 permit, two week package including airfare, overnight in London, including a donation to Lincoln Park (Chicago) Zoo, with the curator of mammals, our own lorry (six people), and guide: under $6k (circa 1998). We have been there and it is expensive, but worth every penny. Yes, we are lucky, Sandra. It really was an incredible experience. I am glad you liked my post. Thank you. What a remarkable adventure! The close-up of the gorilla with the big, soulful brown eyes, looking off to the side really got me…so very touching. Very GREAT.. and more to come. Stay tuned. Hi Leah – looks like it was a GREAT trip!! Bob..
Oh Leah, what a wonderful experience and your photos are really touching – such gentle creatures. Maybe we humans could learn a thing or two from their social customs. Can’t wait for the next Tales and Travel from Africa. Même si tu arrive a grimper dans uns arbre t’as aucune chance! Sounds like a wonderful trip. Looking forward to reading follow up post. THIS is the post I’ve been waiting for, and am definitely not disappointed. 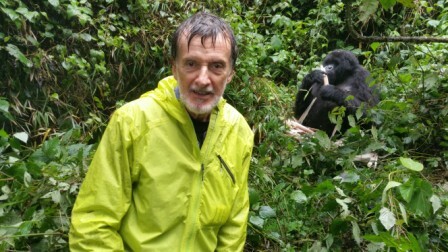 I almost feel as though I was lucky enough to be there with the gorillas. I can feel their presence. Thank you for sharing the drama of this once-in-a-lifetime experience. Truly monumental, I’m sure there is no greater thrill. Wow… now that’s a compliment to cherish!. Thank you, Noel. We are sorry we missed T’day with you, Carol and your friends. But, we are not sorry we went to Africa. The gorillas are not to be missed. It was my plan, of course, that you and BB/VR would spend Thanksgiving with us – there were 16 of us from 5 different countries this year, and a great time was had by all! You had other plans. I would have traded my drumstick to be a porter on your trip. We have known each other for many years, and I have read everything you have written, cutting them out of newspapers and mailing them to you, as you recall. But I have never before had tears in my eyes reading about your adventures. This one was very special. Keep trekking, girl! Perfect for Easter and exquisite. 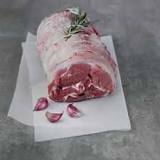 Click on photo for recipe and scroll down for more recipes. GET THIS BLOG IN YOUR INBOX! Tales and Travel Blog at WordPress.com.